We've partnered with Levi's to show you why fashion girls love their 711 skinny jeans. As fashion editors, it's part of our job to stay up to date with the hottest brands and break down the latest trends. But when it comes to our own personal style, we play favourites just like the next girl. So, what tops our list of can't-live-without pieces season after season? Our Levi's jeans. After all, there's nothing more reliable, effortless, and cool than a great pair of denim — plus, they go with literally everything in our closets. Here, three fashion editors with completely different tastes style their favourite pair of jeans. From a sophisticated black wash to casual distressing, click through to see each editor's top choice and read about why the Levi's 711 has earned cult status in their wardrobes. To complete her casual, tomboy outfits, fashion editor Rebecca reaches for her medium-wash skinny jeans with light distressing. "I love the detailing on this pair since they add interest without feeling too over the top," she said. "Plus, the skinny fit adds a streamlined, modern touch, especially when paired with oversize tops." For a slightly rugged effect, she threw on a short-sleeved utility shirt over a striped jumper and finished the look with a pair of polished work boots. 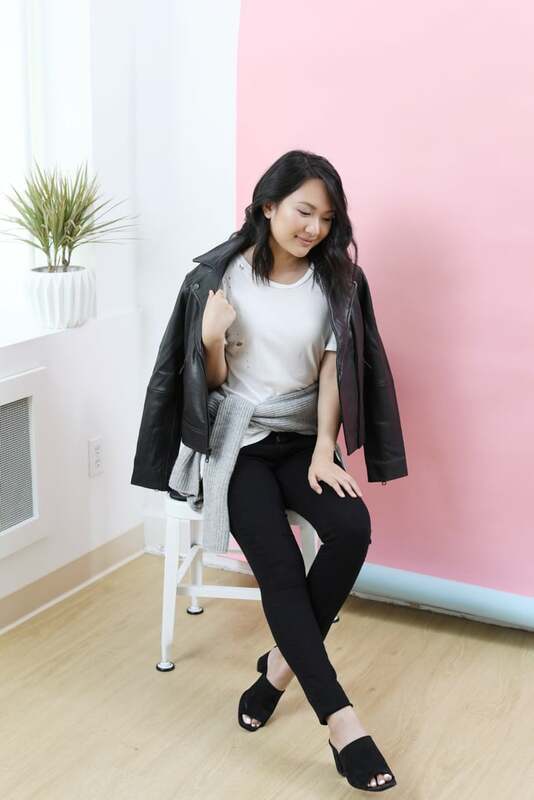 Assistant fashion editor Stephanie considers her classic black skinny jeans a mainstay in her minimalist, monochromatic wardrobe. "I reach for my Levi's jeans more than any other pair in my wardrobe since they serve as the perfect base for my signature black and white outfits," she said. Here, she went for an edgy vibe by wearing her jeans with a distressed tee and leather biker jacket. For shopping editor Carlina, a pair of faded grey skinny jeans help to anchor her on-trend ensembles. "I love my Levi's skinny jeans since they complete any Autumn outfit. I love the shade, too — so timeless," she said. She threw on a chunky knit for a seasonal look and added a pair of unexpected studded ankle boots for a dash of whimsy. Shop more Levi's 711 Skinny Jeans!